How Long Will EA's CEO Sit on the Hot Seat in 2013? The company's share price dropped by a third in the past year, and expensive incursions into mobile and social games development haven't yet panned out. Adding insult to injury, Electronic Arts was booted out of the NASDAQ-100 Index for poor performance. Figure in the continuing decline of video game sales on traditional platforms, and John Riccitiello, EA's CEO, could find himself sitting at a long conference table as someone from HR explains his COBRA options. 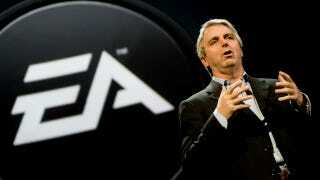 EA's CEO is one of eight "CEOs to Fire in 2013," in the opinion of 24/7 Wall Street, a blog for investors. Riccitiello is in good (or dubious) company, alongside Michael Dell and the founder/CEO of flavor-of-the-minute Groupon, whose revenue growth of 32 percent in the past quarter no longer represents a skirt worth chasing. Slower growth is one thing, outright losses are another, and EA's gone $2.5 billion in the red over the past four fiscal years, which straddles much of Riccitiello's tenure. "The case against Riccitiello is easy to make. His ability to move more of the company's revenue to new social media and mobile platforms has been poor," reasons Wall Street 24/7. There's also a case to be made that expensive bets on Playfish, PopCap and Origin take a while to pay off, too. A new console generation expected to have a heavy digital distribution component makes this an uneasy time to switch leaders, especially one who made Origin a centerpiece of EA's future. This still is not a great case to make when you're trying to save your job, though. With a management team bearing Riccitiello's deep thumbprint, thanks to reorganizations in 2007 and 2011, it wouldn't appear that some in-house successor is poised to take the company in a different direction. Peter Moore, the chief operating officer, definitely is CEO timber, but he was brought in by JR to run EA Sports in 2007. If a board of directors dumps Riccitiello in 2013, it may not want any of his lieutenants running the show, either. Depending on what hardware is or isn't announced at E3, 2013 could be a year of upheaval, and it could cost Riccitiello, the leader of the dominant publisher in Western markets, his job. Like them or hate them, new leadership at EA, or even the threat of it, moves the discussion for all of video games, and sets an uncertain tone for the coming year.